In past few years, SMS technology has brought a revolutionary change in business world. With various SMS strategies, it is also very important to choose a good SMS gateway provider who can help you make most out of all SMS strategies. • What Is Their Cost Of Service? Although, SMS technology is considered to be one of the cheapest ways of marketing and advertising still it is important to consider their cost of service. Every SMS gateway provider will offer you different cost of service depending upon the type and tenure of the plan that you choose but it is still very important to know the prices and rates in advance. 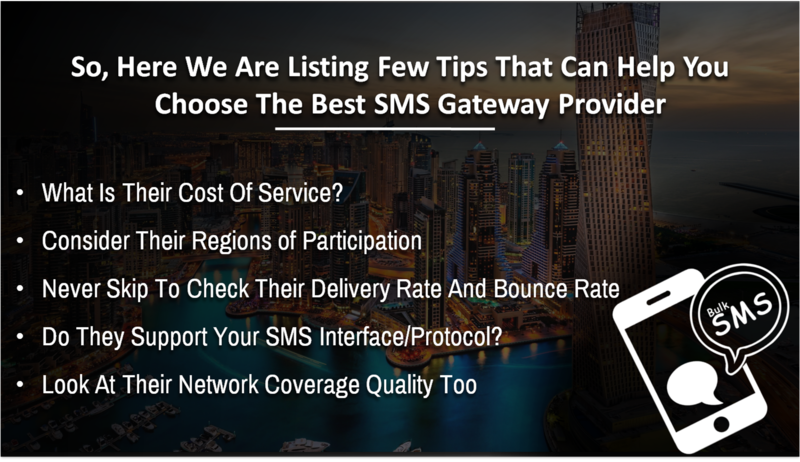 The next very important thing to consider while selecting a SMS gateway provider is their regions in which they are serving their services. Choose the one that offer wide and international coverage. More the coverage better will be results. So, make sure to consider this point always. Offering bulk SMS services, it is essential to know their speed and delivery success rate too. Depending upon the quantity, both of these things can vary but it is still a very integral factor to consider. You can ask the provider for their stat reports to know the exact delivery and bounce rate. • Do They Support Your SMS Interface/Protocol? This point of consideration is bit technical but still you need to know this and ask for this. Your SMS gateway provider should full support the API (application programming interface) that you use for your SMS services. Besides just considering the cost, region coverage, delivery and bounce rate, one should also consider the overall quality of their network coverage. No matter how reasonable their services are but remember to never compromise with the quality of network coverage. So, when next time you think of using a bulk SMS service for your business, make sure to consider above mentioned tips to hire the best SMS gateway provider. These tips will surely help you choose the best from the rest which will eventually help you only in efficiently using your SMS strategies.